Following last month’s disaster of a crepe cake, chosen by yours truly, I think some of the Daring Bakers were expecting a simpler recipe this month. Ha! Not with Helen having the honour of choosing the May recipe. This is the same woman who barely batted an eyelash at my crepe cake and who routinely produces masterpieces in pastry decorated with spectacular sugar art. I knew Helen would have quite the challenge for us indeed. Then I found out that Helen had chosen to take on Anita as her co-host. Anita also has a way with all things intricate and mouth wateringly beautiful. When the two of them teamed up I knew that the crepe cake would be nothing compared to whatever they chose for us. I wasn’t disappointed. Helen and Anita decided that we would all be making our own puff pastry. Not daring enough? We’d also be making chiboust cream. Still not daring enough? Add cream puff making to that list. You want more? Top that with a caramel creation. When you put all of that together you end up with a Gateau St Honoré and a little piece of Paris right in your very own kitchen. 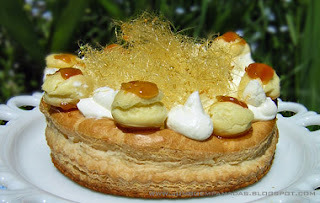 Had you have challenged me to make the Gateau St Honoré a year ago I think I would have hidden in a corner. But since that time I’ve conquered croissants, and pasta making, hell, I can even make my own sausage and bacon! Macarons aside, I can make anything! And honestly, this cake wasn’t that difficult. It was a two days process that involved lots of steps, but when it was broken down, no single area was hard to complete. The end result really does look like it could come from a bakery. I was impressed, but then again, I was also impressed by the process of filling the cream puffs, call me a simpleton. Actually, I think filling the cream puffs was my favourite part of the whole operation. I took a syringe meant for injected meat with, (cleaned it) stuffed it full of chiboust cream and squirted it into the bottom of the cream puffs. I loved watching them become firm and plump as the chiboust cream pushed out the cream puff walls. Sometimes I got a little overzealous and chiboust cream would explode everywhere. That was the best part. The other thing I enjoyed about this challenge was the leftovers! Don’t ever, EVER throw out extra chiboust cream, (especially if you flavour it with rum like I did, mmmm). 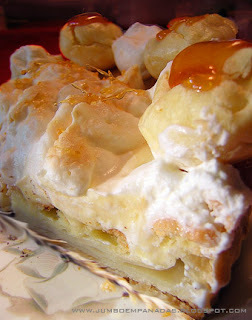 I used mine as filling for mille feuille and macarons and there was still some leftover so I stuck it in the freezer. It didn’t stay there longer than a day because I ate it like ice cream and it was D-licious! Leftover puff pastry was excellent for making mille feuille and I still have a block of it in the freezer for another adventure. Believe it or not there were extra cream puffs too which are now hanging out with the puff pastry in the freezer as I recently found out they can be filled and then frozen with no ill effects. There would have been many more cream puffs in the freezer, but my mouth got in the way. They were just so easy to devour in one bite, I couldn’t help myself. The only part of this challenge that may have caused a bit of cursing in my kitchen was the caramel. I’ve fought many battles with caramel and it has almost always won. This most recent battle ended in a tie. The first pot of caramel had to be thrown out. The second one, though still difficult to work with, produced the half decent results the you see before you. I have fellow Daring Bakers to thank for that too. Last month we were supposed to top our crepe cakes with caramel dipped hazelnuts. I chickened out and stuck strawberries on top. After reading all of the other bakers posts however, I learned a much more efficient way of making spun sugar that doesn’t involved coating your kitchen in sticky stuff. You simply open the dishwasher, tape some skewers to the top rack and wave your caramel over top. All of the excess falls into the dishwasher and when you’re finished you just close the door and turn it on. No mess! That’s smart thinking and I take no credit for it. I’m simply passing it along so that others can benefit from this gem of wisdom. Don't ever let the sugar get the best of you! The recipe can be found in its entirety over at Tartelette and Dessert First where you will also find links to the other Daring Bakers’ creations, (you can also find all 48 of them in my sidebar, in the Daring Bakers drop down menu). Many thanks to Helen and Anita for their wonderful selection, I thoroughly enjoyed this challenge. Posted by Brilynn at 1:33 a.m.
That is a beautiful huge spun sugar creation - awesome dear girl! A bit of a show stopper maybe! Brilynn, me too, my favorite part was to inject the cream, my fingers just enjoyed feeling the puffs getting fatter and fatter! WOW!!! You daring bakers keep getting more daring. This is lovely, and looks sooo delicious. It's beautiful!!! I have trouble with caramel sometimes, but yours looks so lovely. I'm in awe of the spun sugar. very daring stuff! looks great! Wow! The caramel net is awesome!!! Beautifuuul Bri, I never got as far as to the spun sugar! You are a pro! And spun sugar too! I'm not worthy! I'm not worthy! Looking beeyootiful as always Bri. My favourite part was when the cream burst out of the puffs too. That was one mess I didn't mind clearing up! Yum! wow! high and mighty :) well done Brilynn. Bril, incredible looking decoration on that cake. You mastered the challenge so well. I too loved the fact that there was so much left over stuff from this challenge. It was fun making other stuff with it. Oh goodness! You conquered spun sugar! Magnificent , Bri! I in the meantime was not so lucky. Brilynn, that looks absolutely amazing. Kudos to you for a beautiful dessert. I bet it was hard to tear into it after all your hard work! Absolutely gorgeous work, Bri! I love, love, love your spun sugar decoration! You rocked this challenge, hands down! It's so beautiful, Brilynn! I love the way your sugar looks! And the crepe cake was NOT a disaster! Man! Look at that beauty! When I picked the challenge I knew you would have the Go Big or Go Home attitude about it and that's why I love you. That spun sugar is out of this world. Wow!! 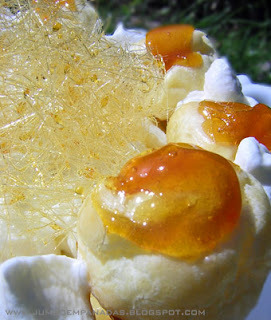 Gorgeous spun sugar - and the rest looks pretty darn good too! Amazing, Bril!!! I LOVE your sugar thread crown - I'm so envious! Your caramel is a gorgeous golden color too..
My favorite part was filling the puffs too.. I wasn't expecting to feel them plump up like that. hee! Way to attack the caramel that I know you love...nice job with your spun sugar. Love love love the meat syringe idea! For someone who has issues with molten sugar, that is a prize winning spun sugar nest. 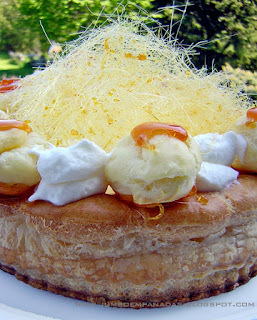 The whole cake is lovely & I love your description of filling the cream puffs. It was fun! 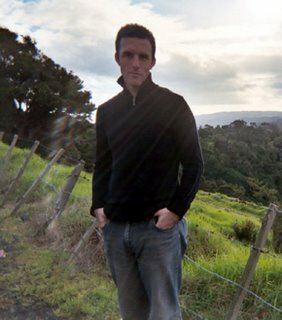 Great photos, too. I´m with the girls, it´s wonderful to see that you´ve finally conquered your fear of caramel! And you used it wisely for that amazing cake decoration. You made caramel cage? Waouuu, you are fearless...I am so scared with evertything that involves sugar and cage but that's another story. 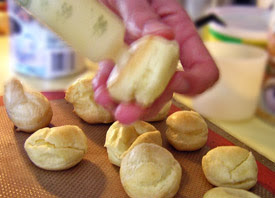 Before using the piping bag, I used to fill les choux with a spoon. It was messy. But for this challenge I wanted to challenge my self and I used piping bag. So much fun when you feel the puff getting filled and filled and filled. At some point I was tempted to fill it more to see if it will explode or not. But then I remembered that I would have to clean my experience...nop. Absolutely lovely - the spun sugar is the most amazing part. Well, how did I know yours was going to look so perfect!! Great job Brilynn. I love the gold threads! 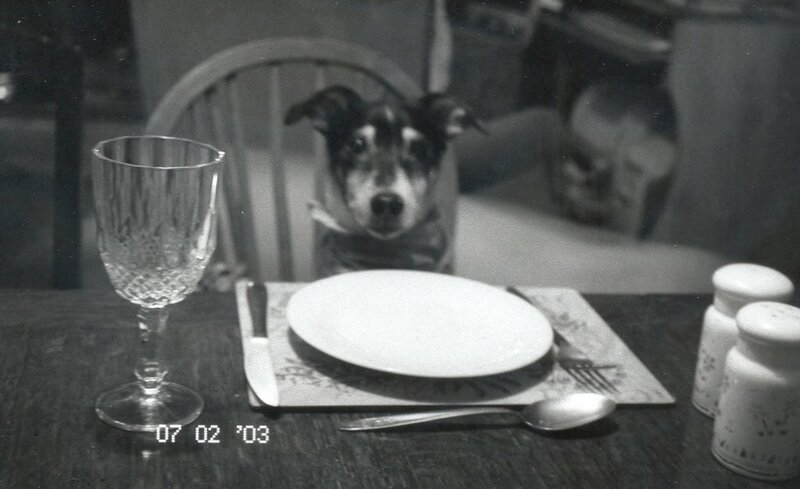 You know good thing I live nowhere near you otherwise I might have to knock on your door begging for a bite. How beautiful! And good for you for conquering the sugar and making a mountain of hair! Your cake -- oh, it's too complex to just call it a cake -- your creation is fabulous looking! Love the whole thing, but especially the spun sugar. Swinging lethally hot caramel around a kitchen is a challenge in itself, getting it to look beautiful (and not having to do more than slam the dishwasher door after it)is a triumph! Your pastry turned out so fabulously! 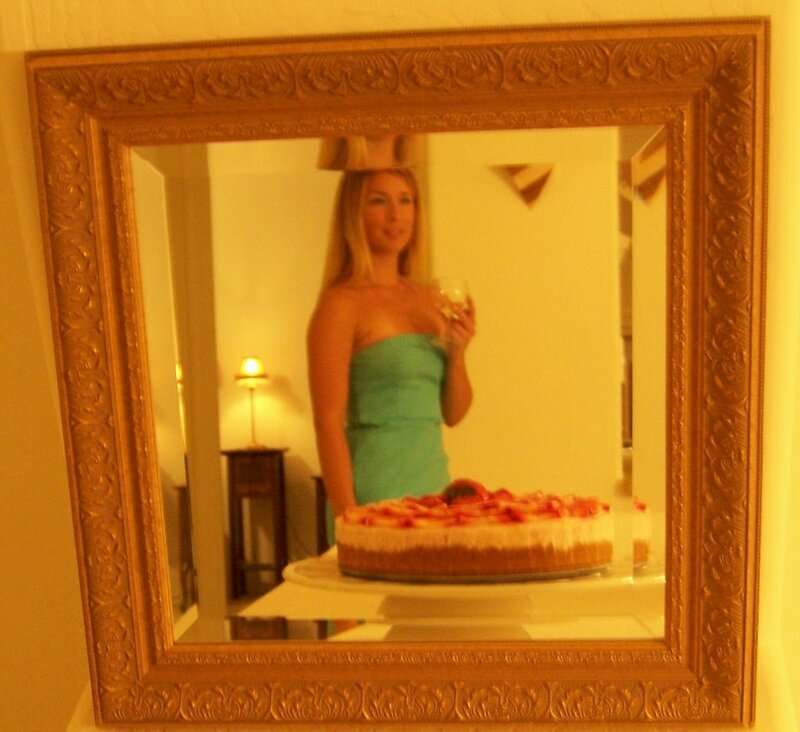 Congrats on a beautiful dessert! Thanks for the tip on making spun sugar - who would ever have dreamt of using the dishwasher as an aid to making this! Oh! nearly forgot to say, wow!! Bri, you are inspirational, my dear friend. That's all I can say - your gateau is perfect!!! And the idea of freezing the cream is just what I needed to know. :) Gonna make myself some ice cream today! Look at that fabulous spun sugar! You made such a gorgeous cake, Brilynn! What an amazing cake. I love the spun sugar. How did you make that? teach me! ; o ) I am still decided to make your challenge as I feel that I let you down last month. Watch my space. WOW - that's absolutely beautiful!! 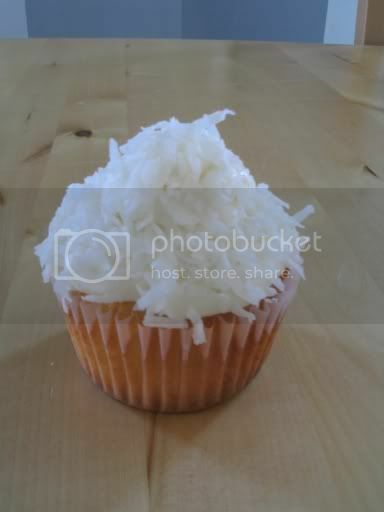 I love the spun sugar on top! I have to agree about filling cream puffs - it's amazing how much cream goes into those little guys!! Your puff pastry looks glorious! So high. Sigh, mine looked like a pancake. And the gateau looks perfect. Awesome job! Bri, I would say you WON the battle of the caramel. That mass of caramel strings is fabulous and yes, extra cream puffs are always a good thing!! What a gorgeous cake. It looks soooo good. Once again, the Daring Bakers have outdone themselves! Your version of the gateau is simply lovely. Amazing! What a beautiful creation. That spun sugar on top looks amazing, Brilynn! All I can say is- INCREDIBLE! The fifty-some people ahead of me have pretty much said it all. Yum! Brilynn - You are right - you can make anything. Your cake looks absolutely delicious. It is beautifully decorated and presented. What gorgeous puff pastry, too. 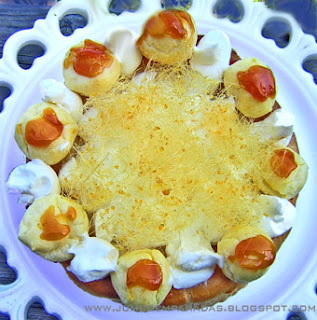 Truthfully, I have been putting off making my own caramel for ages...I should stop being so afraid because I am missing out on making so many great things, like this Gateau St. Honore. Bravo! I have no idea there's such event for baking skill like this. I have been thinking to try to make caramel threads and haven't really figured out how to do it. You gave me the idea, Brylinn!! Next event, I'd like to enter!